Set within a fantastic warehouse conversion in the heart of Wapping this stylish one bedroom flat boasts a superb open-plan reception room with space to dine, large bedroom with built in wardrobes and a lovely balcony. Wapping Lane is ideally located in the heart of Wapping among the charming cobbled streets and only moments from the shops, restaurants and pubs on offer as well as Wapping Station. 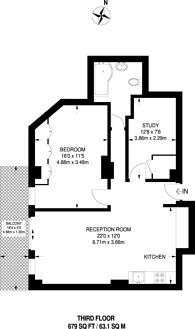 679 (63 Sq M) approx.